For reasons best known to themselves, Otago University’s senior management this week provided climate denier and serial plagiarist Bob Carter with no fewer than two opportunities to spread his misinformation and misrepresentation of the state of climate science. 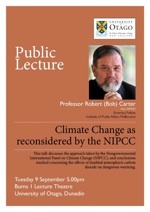 The first, a public lecture on Tuesday evening (poster on left), gave Carter the chance to spruik his Heartland-funded and partially plagiarised “NIPCC” report. The second — given to the geology department of which he was a member from 1964 to 80 — was titled Has environmentalism become anti-scientific? Four Australian case studies. Given that Carter now represents himself as an “emeritus fellow” of the Institute of Public Affairs, Australia’s home-grown version of the far-right US lobby group the Heartland Institute, his conclusions in either presentation are not difficult to guess. At Tuesday’s public lecture he was not given an easy ride, as an on-the-spot reporter confirmed to Hot Topic. Carter was welcomed by the local branch of the Flat Earth Society. Every five or ten minutes there were cries of “We love you Bob Carter” (in a West Indian accent, my source confides) from outside the lecture theatre. There was the usual slide comparing the ensemble of GCM models with “actual data”, the latter from Spencer (radiosonde and satellite). At question time, a student asked if this data was truly global or just for the tropics, and Carter lied by insisting it was global. He showed CO2 levels over the last 500 Myr, which makes clear the uptake of CO2 from about 10-15 times current levels from the formation of coal deposits during the Cretaceous. He then argued that all we are doing is digging it up and putting the carbon back where it came from. What can be the harm in that? Probably not much if you are dumb enough to think that humans could survive in a Carboniferous climate. Question time was a little bumpier for Carter. Alan Mark in particular was quite scathing of Carter’s views. One questioner gave a thorough description of his involvement as a lead reviewer for IPCC and challenged Carter’s allegation that the IPCC was political. Carter did not explain the difference between the WG reports themselves and the Summary for Policy Makers (for which the bureaucrats do have input). By contrast, NIPCC was completely independent and not conflicted in any way, he alleged. That drew a few sneers from the audience, and a question about where the NIPCC funding came from. Some family trusts, he said. Which family trusts? Not going to tell you, he said. For the record, let us note that Carter is paid by Heartland for his role in the NIPCC, which is a “panel” put together by Fred Singer and the Heartland Institute purely as a propaganda publication. Any relationship between the NIPCC and real science is entirely accidental, and Carter is up to his neck in the fossil-fuel funded extreme right wing campaign to delay action on climate change. Quite why Otago University chose to give Carter a platform remains a mystery. The University obviously has an extremely broad definition of what constitutes an academic contribution to public debate. No doubt we can look forward to further university-sponsored lectures from anti-flouride activists and chemtrails enthusiasts — both delusions with as much credibility as Carter’s Nongovernmental International Panel on Climate Change. Carter — a proven plagiarist who never saw an argument against action on climate change that he wasn’t willing to promote if paid enough — has lived up to expectations. Otago University has failed to meet them. I missed his first address on Tuesday but caught the second on Wednesday in the geology tearoom. The subject was advertised as “Has Environmentalism become ant-scientific? Four Australian Case Studies”. He began by accusing environmentalism of confirmation bias and then proceeded to exemplify the same characteristic himself with cherry picking and straw man arguments for good measure. Of the latter he claimed the GBR was not threatened by river silt but no detail on acidification (up 16%). He also neglected to mention glacial recession. What he did focus on was sea level measures which for good reason vary from one location to another. That looks like unreliable data to the uninformed. When he insinuated NIWAs temperature data had been unprofessionally massaged, Gerrard Liddell’s protestations were treated quite belligerently. He also made patronizing remarks to the young people present and tasteless comments about Islamic terrorists and virgins. I am ashamed to admit I went unprepared and didn’t speak up. It wont happen again. As for why Otago University chose to give Carter a platform, it may be for the same reason that Auckland University hosted Loony Lord Monckton last year – an retired professor had booked the lecture theatre under a pretext. Such was my enthusiasm to meet the Great Man himself, I arrived early and witnessed two University officials giving the organisers a very hard time re the fire regulations and closing time, leaving no doubt as to the University’s opinion of the event. Using the University of Otago masthead is pretty cheeky; it implies that he is associated with the university. Anybody should be allowed to speak at a university in the spirit of open discussion but expect to be pilloried for talking cr*p.
It was a “public lecture” at Otago University, hosted at their premises, and I presume used the masthead for that reason. Alan Mark is a prince among men, as is Keith Hunter. Why would UoO go to all the trouble of bringing in a bozo brain from Australia, when they have a high degree of specialist knowledge on climate change already on campus? I have a colleague who publishes papers on protein chemistry, who fully understands the peer review process, but disregards it when it comes to climate change. Instead he favours a poorly referenced non-peer reviewed book by John Kehr “The Inconvenient Skeptic”. He shows me a graph showing all the ice that has melted and sea level rise since the last ice age, clearly proof that CO2 is not a factor. The other problem is that many of these people are easily agitated and unwilling to listen to facts. I despair when people who should know better are hard of hearing, they latch on to a pseudo factoid and blank out all other information that might burst their little bubble. Hopefully Otago University is even-handed and allows similar lectures by bigfoot hunters, moon-landing hoaxers and anti-vaxxers. Somehow I don’t think they will. I wonder why that would be?